In “Pieces of Eight”, your ship, the Success, has captured a heavily laden East-Indiaman, which is returning to Europe from the Orient. Among its crew is an aged native whose race is unknown to you. After a little persuasion, he tells of an island some distance to the southeast, well away from the commonly used trade routes. This has been his home, but as he is the last of his civilisation, the island is now uninhabited. 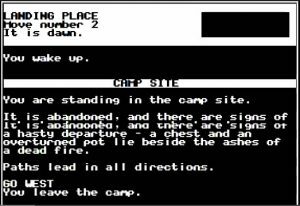 You and your pirates head for the island and set up camp. 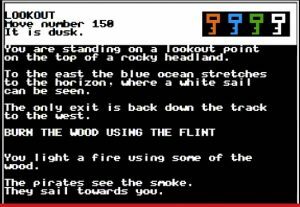 Strange and frightening occurrences at night make the other pirates scramble to retrieve their weapons and head for the boats. Grabbing your cutlass, you attempt to block their way. Quickly they disarm you and give you one chance to save yourself: they give you one day to discover the secrets of the island. You are then struck from behind and know no more …. You wake to find the first rays of sunlight colouring the eastern sky. The camp is deserted, the boats are gone, your possessions have been taken. 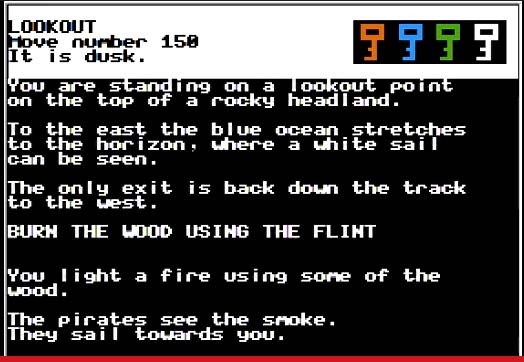 Your task is to find the treasure and recall the crew before nightfall, or stay on the island forever. “Pieces of Eight” is designed as an individual or small-group manageable, language-based, educational courseware package. The program, when operating with a small group, promotes dynamic, collaborative interaction and co-operation. 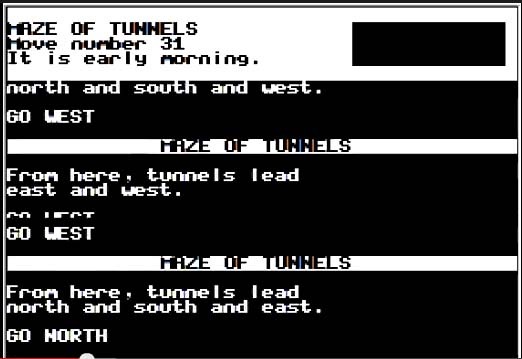 Using the software makes students apply a broad range of problem-solving techniques and logical-thinking skills. The Queensland Department of Education is the sole copyright holder of the game. Jacaranda were paid a fee to participate and have no ownership. The title was published by the Department through its own Production and Publishing Services, and will not appear on a Jacaranda title list. 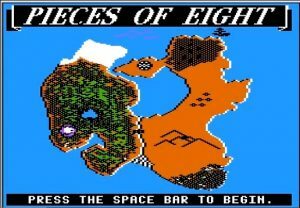 The “Pieces of Eight” disk image is available for download at: ftp://public.asimov.net/pub/apple_II/images/educational/pieces_of_eight/. 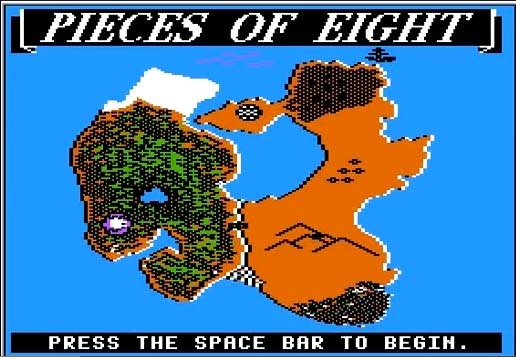 Pieces of Eight was released for a range of systems, including Apple II, BBC, and C64. 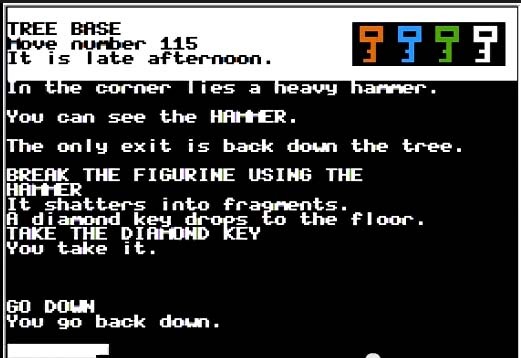 Geoff Body programmed the Apple version. David Smith programmed the BBC version. A Microbee version was produced but never distributed commercially. 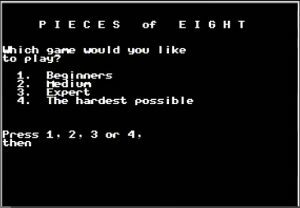 Pieces of Eight - manual-part 1, Pieces of Eight - manual-part 3, Pieces of Eight - manual-part 2. While Jacaranda was paid to produce Pieces of Eigth, it looks like the company was also willing to perform the inverse operation as well. 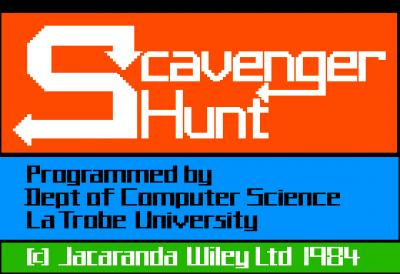 According to the introduction screen of the Apple // version of “Scavenger Hunt”, it is copyright by Jacaranda but programmed by the Department of Computer Science at La Trobe University. 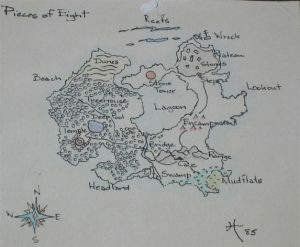 Even 25 years later, I still remember one bit which drove me mad. Walking along the edge of a cliff would result in instant death. 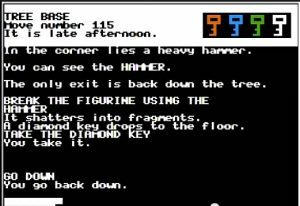 It turned out the trick was to add the word *carefully* to the text command, but it took several deaths to figure that out.